Advantages: High quality production; comprehensive coverage of the specific project; lots of handy general modelling tips; easy to use menu; accessible presentation style. Floyd Werner will be well known to most of HyperScale's regular visitors through his online articles as a talented and prolific modeller. Many will also know that Floyd's favourite aircraft, without question, is the Messerschmitt Bf 109. It is therefore not surprising that Floyd has chosen Hasegawa's 1/32 scale Bf 109G-6 as the first subject in the Master Class Model Building Videos series. This ambitious project spans three DVDs and more than five and a half hours. The first DVD commences with some brief historical background but tackles the subject matter without delay. The modelling Master Class is undertaken almost literally at the elbow of Floyd. Floyd Werner builds Hasegawa's Gustav in almost real time, and covers every aspect of parts preparation, construction, painting and weathering. 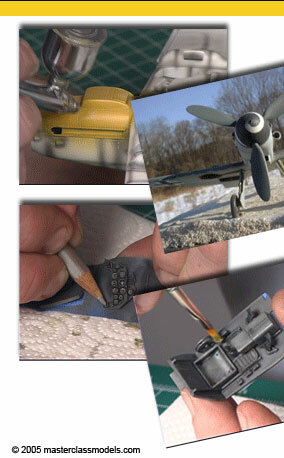 The focus of the DVD is to demonstrate the techniques that will be useful to build an attractive model straight from the box. I believe that the very best way to learn how to build and paint a model is to watch a talented modeller at work, then try to emulate what that modeller does. The practical limitation is that there are not many modellers with the patience and inclination to let you watch an entire model build, and who would explain what he is doing and why through every step of the way. The Master Class Model Building Video, however, offers exactly this service. Being a DVD, you can also review and repeat any section that you feel that you need to see again. I watched much of these DVDs with my wife. She commented that she felt as if she was building the model alongside Floyd which, I imagine, is exactly the result that the producers were shooting for. Although the Master Class Model Building Video is probably targetted to the less experienced modeller, I found it fascinating to see some of the specific techniques used by Floyd that were different to mine. I will be testing a few of these different techniques out in future modelling projects. Technically, the DVDs are very well presented. The video and audio are high quality, and the menu is easy to use - you can skip to any area of interest with the press of a button on your remote control. Floyd's presentation style is clear and quite accessible. 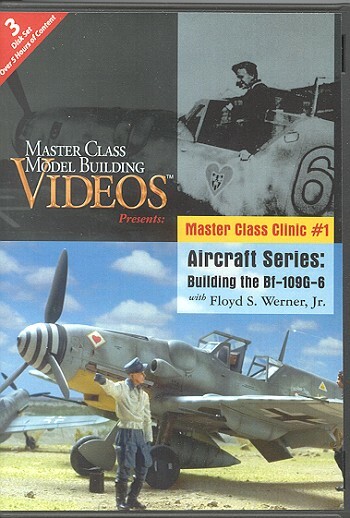 "Master Class Model Building Videos, Master Class Clinic #1 - Building the Bf-109G-6 in 1/32 Scale" is an excellent introduction to the essential techniques of building any plastic scale model. Whether you are new to the hobby, or want to improve your skills, or are interested in seeing a fellow modeller at work, this is a worthwhile resource to have in your modelling library.